Being Retro: Facebook Fridays... Or It's Over Johnny! So how would you die, thank you to the creative people who send hours coming up with cool stuff on Facebook or where ever you might share it... I was tickled to death in the woods by Lucille Ball! So are you cooler than me, tell me about it! Have a great day and safe pending holiday. Eaten by Mike Myers in a haunted house. Well, that's not very exciting. Chopped by Frankenstein at a cabin on the lake. Gee, you think I'd be able to outrun him. Beaten By Chuckie in a run-down old house. Great killed by my sons My Buddy Doll. 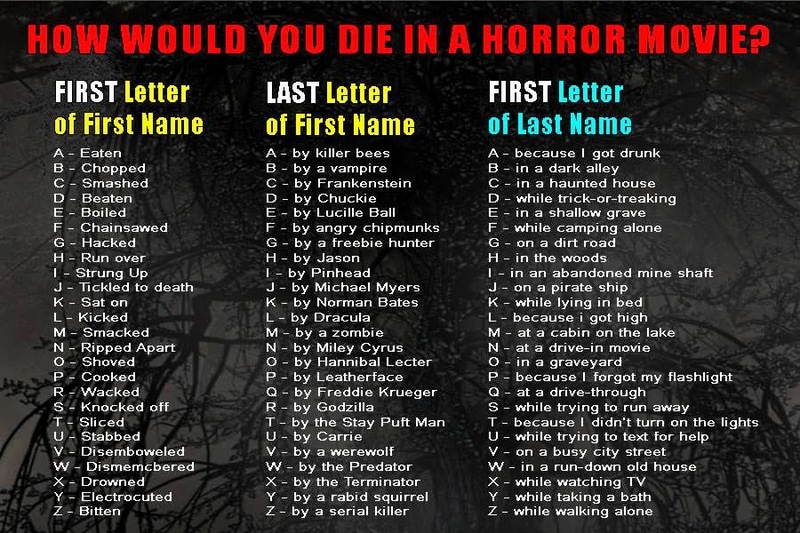 Kicked by Killer Bees because I got high. That's a lot of kicking! "Hacked by a rabid squirrel because I forgot my flashlight"
A good weekend to you, Jeremy. Smacked by Lucille Ball in a shallow grave. Wacked by Chuckie while taking a bath -- now that's embarassing! Neat and fun idea!